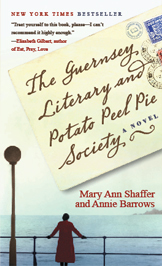 The Guernsey Literary and Potato Peel Pie Society » Week 6 Essay Winner! « Week 5 Essay Winner Is Up! My favorite book? Please!! That’s like asking a mother to pick her favorite kid! I have read—just guessing— hundreds of books in my near-70 years (Okay, 65 years since I couldn’t read until age 5) and you ask me to pick my favorite? Even so, in order to enter the contest, I decided to choose one book I have read and write an essay on it. I never read books that I don’t like. I may start one but never finish it. A recent book that I finished—therefore liked—was “The Preservationist” by David Maine. Not my usual reading fare, but in his new slant on this ancient tale Maine captured my imagination with his vivid descriptions of the insurmountable problems faced by “Noe” as he obeyed God’s commands without question. I learned the Bible story of Noah and the flood early in life, but until Bill Cosby came out with his comedy version back in the 1960’s I never really questioned the premise of a 500-year-old man building a huge boat to save his family and two of each kind of animal from a flood that was to cover the entire earth. Maine’s version reads more like a reality show, only with more reality! Hear “the wife” questioning in Part One: “So when Himself starts with the visions and the holy labors and the boat full of critters, what am I supposed to do? Talk sense? Ask questions he can’t answer, like, How do you propose to keep the lions from eating the goats? Or us for that matter? No thanks. I just fuss with the stew and keep my thoughts stitched up in my head where they belong. Long ago I quit asking questions.” What wife doesn’t relate to that kind of logic? The astounding thing about “The Preservationist?” I expected a farce, but the more I read the more logical it became until I could almost believe that the events happened just like the author said. Impossibilities were explained away and made to seem entirely possible. Maine managed to allot a distinct personality to each character and I found myself playing favorites among the sons and daughters-in-law. “The Preservationist” was a fascinating read, and I have already ordered Maine’s “Sampson” to see what take he puts on that familiar story. This entry was posted on Wednesday, October 14th, 2009 at 10:07 am	and is filed under Uncategorized. You can follow any responses to this entry through the RSS 2.0 feed. You can leave a response, or trackback from your own site. What a joy to read your essay of The Preservationist! You’ve intrigued me enough to check it out.